Instead of just choosing a boring mid-size sedan, make the selection that will add some fun into your life. 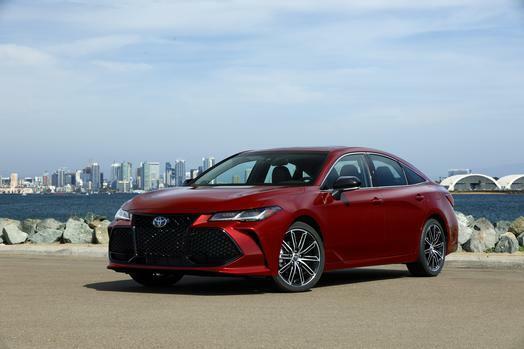 The 2019 Toyota Avalon has a bold style that’s backed up by solid road dynamics. You also benefit from an interior that’s loaded with everything you need and want. Find your 2019 Toyota Avalon for sale in Ontario by coming to Hometown Toyota. We have a great selection of vehicles and knowledgeable sales staff to assist you, whatever your needs may consist of. You might not expect to have fun behind the wheel of the Toyota Avalon, but this full-size sedan has been created to thrill you in many ways. The sophisticated performance doesn’t sacrifice comfort, so you and your passengers will be happy during short of long drives. Several features combine to make the Toyota Avalon a performance master. That sleek bodywork has been optimized for aerodynamics, including an available rear diffuser and underbody panels. The car boasts a coefficient of drag, so it slips through the air with ease. Adding a big boost in performance, the standard 3.5-liter V-6 engine hits hard with 301 horsepower. Variable valve timing-intelligent wide, direct injection, and the 8-speed automatic transmission boost efficiency to new heights. Touring models have a new adaptive variable suspension. It automatically and instantly adjusts damping for razor-sharp handling and stability, even on roads that are excessively rough. Toyota uses some of the most advanced and proven technologies, meaning you get a reliable and modern experience when driving in the Toyota Avalon. One of the central features, the Entune 3.0 is a next-generation infotainment system. It has a 9-inch full-color touchscreen with pinch-and-zoom for navigation. Also included is an app suite and onboard WiFi that will connect up to five devices to high-speed internet. Apple CarPlay compatibility makes connecting your iPhone to the system easy, too. 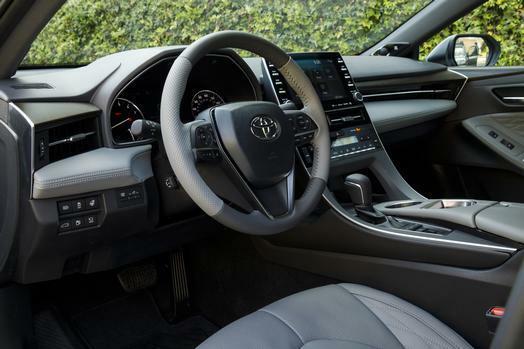 You can also access the car remotely with an Apple Watch or Android smartwatch, thanks to the new Toyota Remote Connect tech. Add the optional JBL with Clari-Fi audio system for the best sound quality for all your music and more. The system boasts 1,200 watts and 14 speakers, plus 7.1-channel surround sound. You can also get a Qi-compatible wireless charging pad in the center console. Just place your phone on it and replenish the battery, without plugging in any wires. Of course, a car like the Toyota Avalon is all about luxury and comfort. From the moment you slide into the front or back seats, it becomes obvious the abundance of space, well-padded, seats, solid cabin insulation, and more combine to create an area of relaxation. If you select the Toyota Avalon Limited, the cabin can be wrapped in Cognac leather upholstery. It’s the perfect complement to heated and ventilated front seats, so getting comfortable takes no time at all. Real wood trim adds the perfect highlight, showing that this flagship sedan is all about delivering the best for you and your passengers. There’s so much more to the Toyota Avalon. Experience these and the other features of this car by visiting Hometown Toyota Scion today.